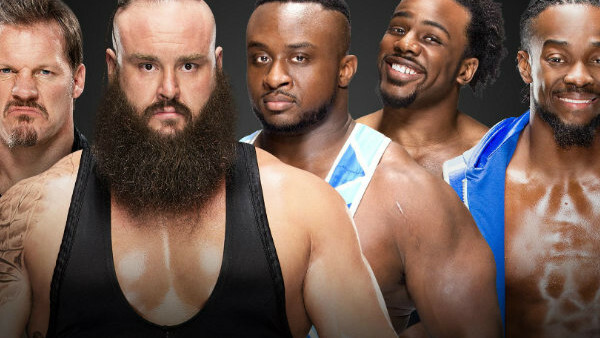 The New Day, Chris Jericho, and Braun Strowman all confirmed for 30-man bout. For more than a month, Brock Lesnar and Goldberg have been the only men announced as competing in the 30-man Royal Rumble match. After Monday's Raw, though, five new superstars have been confirmed for the high-stakes bout. The New Day were first to announce their participation, stating that they had joined the match in a segment where they shared their New Year's Resolutions. Though Titus O'Neil interrupted them, Xavier Woods won a quick bout with the former WWE Tag Team Champion, proving that the trio has momentum heading into the Rumble match. Later on the show, and during the debut of "The Kevin Owens Show," Owens's best friend Chris Jericho announced that he would also be in the Rumble match. That initially gave Owens pause, but when Jericho explained that his winning would mean that they would still be the WWE Universal Champion after WrestleMania, "The Prizefighter" calmed down (or pretended to). Later in the segment, Braun Strowman made his way to the ring and confirmed that he'd also be in the match. Given that Strowman is rumored to be facing Roman Reigns at WrestleMania and that Reigns may emerge from the Rumble as Universal Champion, the titanic star has to be considered a favorite to win. The Royal Rumble airs live on the WWE Network on January 29 at 8:00 PM ET.